Newspapers across the country published President Abraham Lincoln’s first Inaugural Address in March 1861, but not all included the correct version. Editors in New Orleans had, as the Chicago (IL) Tribune explained, “horribly botched” the speech. 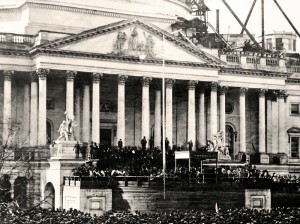 Not only had “words [been] altered,” but sentences [were] cut in two in the middle and other sentences [were] run together.” As a result, Lincoln’s speech had been turned “into a ridiculous jumble and mass of nonsense.” While Tribune editor Joseph Medill knew from experience that “a long document [rarely] is transmitted over the wires without undergoing more or less transformation,” he believed in this case that New Orleans editors deliberately included errors in order to further their disunion agenda. “Evidently the conductors of the secession press are unwilling that the people whom they have hurried into rebellion without a cause, shall have the opportunity of learning the truth or of listening to exhortations of loyalty,” as Medill concluded. The only “parallel instance of meanness” that Medill could recall had occurred during the Lincoln-Douglas debates in 1858. As the Tribune noted in September 1858, Democratic editors told their reporters “to report [Lincoln’s speeches] incorrectly, to leave out words and sentences, and otherwise to mutilate his arguments so as to destroy their force and effect on the minds of those who read the Douglas papers.” You can read more about the Lincoln-Douglas debates in Michael Burlingame’s “Mucilating Douglas and Mutilating Lincoln: How Shorthand Reporters Covered the Lincoln-Douglas Debates of 1858,” Lincoln Herald (1994) and Allen C. Guelzo’s Lincoln and Douglas: The Debates That Defined America (2008). As for President Lincoln’s First Inaugural Address, see chapter 3 of Douglas L. Wilson’s Lincoln’s Sword: The Presidency and the Power of Words (2006).